We are inspired by our passion for innovative architecture, design and attention to detail, as well as by our love of gastronomy. 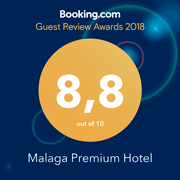 In our boutique hotel we have given shape to our most sophisticated ideas to create accommodation in Malaga aimed at business clients, families, couples and friends. Are you coming to Malaga for business? Our designer gastronomic boutique hotel is the perfect option. In this case, work is not at odds with pleasure. And whenever you have a break, you will find the culture and life of Malaga at your feet: a perfect combination of work and pleasure. Are you coming to explore the city? Thanks to our flexible offer, we have rooms for up to six people, perfect for spending family holidays on the Costa del Sol or for an unforgettable city break. Enjoy unbeatable gastronomy and atmosphere and a full cultural and entertainment offer at just a few steps from our hotel in Malaga centre.